The Saskatchewan province holds largest EOI draw at lowest scores till date for both Express Entry as well as Occupations In-Demand candidates. The above province has also removed nearing to two professions from In-Demand Occupations list. 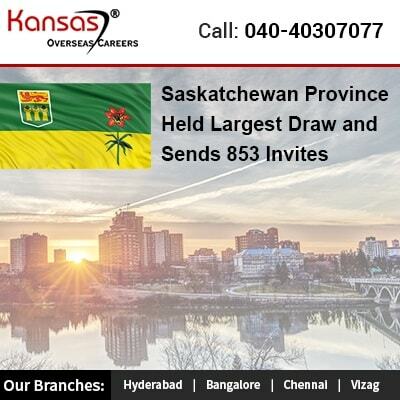 This Saskatchewan Provincial Nominee Program has sent nearing to 853 invites to candidates belonging to Express Entry as well as Occupations In-Demand immigration sub-categories to apply for provincial nomination. Nearing to 359 Express Entry sub-category candidates was offered invites to apply for the draw conducted this year, on 10th October 2018. The candidates who scored as low as 60 under the Saskatchewan’s point assessment grid were offered invites. For Saskatchewan’s Occupations In-Demand sub-category nearing to 494 applicants were offered invites to apply. The candidates who received scores as low as 63 received an invite. From the time the Saskatchewan Province Nominee Program have began Expression of Interest (EOI) for the 2 sub-categories in the month of July. The minimum score for sub-categories was the lowest drawn till date. For Saskatchewan immigration, the SINP’s Express entry sub-category is linked to the Federal Express Entry System. This helps manage the pool of candidates for 3 major classes of economic immigration candidates for Saskatchewan Canada immigration, they include the Federal Skilled Trades Class, the Federal Skilled Worker Class and the Canadian Experience Class. The applicants to be eligible for this sub-category, the Express Entry applicants should score minimum 60 on Saskatchewan’s point assessment grid and should have work experience in the high skilled occupation listed on the provinces In-Demand Occupations list, amongst other criteria. All those Express Entry applicants who have got a provincial nomination tend to receive an extra 600 points for their Comprehensive Ranking System (CRS) Score. This would help the applicants to move to the front of the lint to get an invite to apply for the Canada PR. We find the Occupations In-Demand sub-category is not aligned with the Express Entry system. The above program is for the eligible candidates who have scored minimum 60 points on the Saskatchewan’s point assessment grid and they have minimum 1 year of work experience during the past 10 years in one of the provinces In-Demand Occupation, this is one of the criteria which need to be met. Do you wish to be considered for Provincial Nomination Program for Canada talk to our immigration consultants for the further clarification and advices.